After being in Korea and Japan I wanted to hang around in a place where I could speak English, but instead of flying back to a cold winter in the UK I decided to go to Malaysia. My ticket from Korea took me to Taiwan and then to Bangkok. I travelled around the country, but I found that everything is in KL so I ended up staying there most of the time. ...most people were pretty much the same as everywhere else in the 20th century capitalist, consumerist planet, "family family", "buy lots of stuff". I did one or two small jobs and worked on the website for Panama. I did do one short volunteer project for the Malaysian Nature Society setting up an English teaching programme on the tourist island of Tioman. 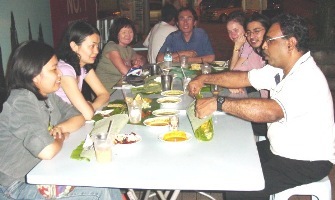 And I often met up with kind Hospitalityclub.org people in KL. The sun shines most of the time, it's got a lot of first world amenities like shopping malls etc, so I spent most of the time hanging around in KL helping a few people while time seemed to disappear. ... With half the population being muslim and the rest mostly sticking around only their own races it's not exactly hippy. ... English is widely spoken, but it's now a third language behind the government official language of Malay and the languages the Chinese and Indian speak at home.